Eddie Yeo, CMO, LG Display, gave a stirring presentation on the current and future program for LG’s OLED TVs. Aside from the number of brands now selling OLEDs TV (13 and still growing) and the virtual lock on best performance assessments from a wide number of agencies in the U.S., Europe and Asia, as well as the growing capacity with 2 Gen 8.5s and 1 Gen 10.5 in the plan, Eddie wowed the audience with a video on the what the future might hold. The video gave a graphic insight into the way large displays will be used in the future. Large area displays will no longer be classified as monitors or TVs; they will be ubiquitous throughout the house or the business. He concentrated on the consumer aspect and showed how the “video wall” would be used to make video calls, check up on children, watch streaming video, interact with the business, plan future outings, see what the world looks like in any part of the universe. We have seen these type of futuristic positions before, but Eddie and LG Display just seems to have done it better and made it more believable. By way of contrast, Christopher J. Savoie, Ph.D., J.D., CEO of Kyulux gave a presentation on TADF that was difficult to believe. He claimed that Hyperfluorescence ™, Kyulux’s adaption of TADF would eventually replace phosphorescence, fluorescence, traditional TADF and even Quantum Dots. 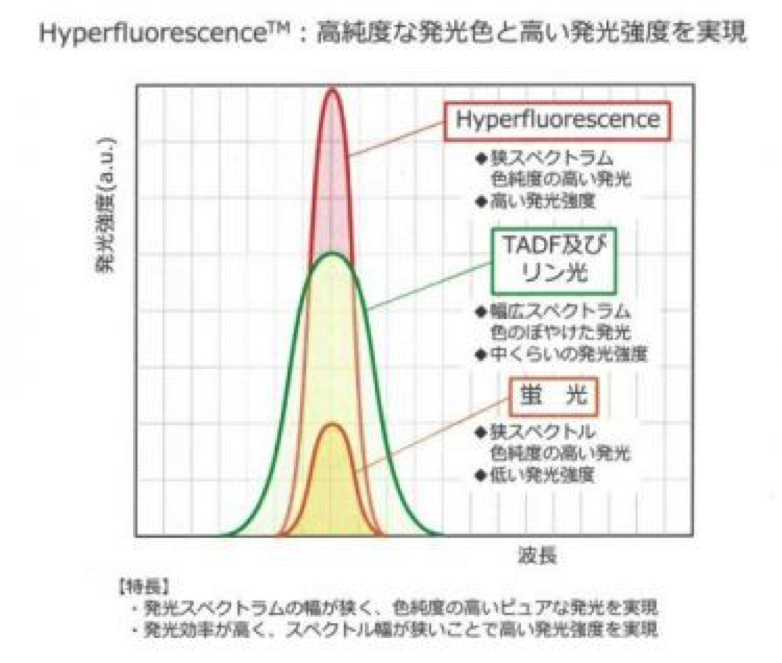 Hyperfluorescence aims at having the effect of phosphorescent material by adding TADF materials to existing fluorescence hosts and dopants. The essence of Savoie’s argument is that by combining fluorescent and TADF molecules, Kyulux can create an emitter, which has the emission properties of fluorescence, including a narrow emission width, similar to quantum dots but with the IQE of phosphorescence because TADF converts triplets to singlets. As shown in the following figure, the triplets in the TADF material are converted to singlets and the singlet emitters from the fluorescent material causes the emitter characteristics of the TADF material, meaning the color, to be converted to the color of the fluorescent material. The conversion must be fast enough such that the TADF singlets and triplets do not emit before they cross the boundary and are converted to the new color. The claim for light emission by Hyperfluorescence ™ is high efficiency, high purity luminescent color, low cost, but also high luminance light emission and low power consumption. The emission spectrum of each light emission principle shown in is described in the next comparative figure. The emission spectrum of Hyperfluorescence ™ has the same width as the emission spectrum of the fluorescent material, but since the efficiency is four times, the emission luminance is also quadrupled and the emission spectrum width of competing phosphorescent material and TADF, is wider than that of Hyperfluorescence ™. Assuming 100% IQE for all three types of light emission, the area surrounded by the spectrum curve becomes equal. At this time, since the spectral width of Hyperfluorescence ™ is narrower as height = brightness. In other words, in the case of flowing the same amount of electricity, Hyperfluorescence ™ has higher brightness and visibility. This characteristic is important for smartphones, which must operate with high brightness outdoors and low power indoors. To demonstrate, what a breakthrough this is, none of the material experts from other companies or universities could believe that such a process would be viable. On the downside of Savoie’s argument, he showed mostly simulated data, rather than the results of actual testing Kyulux had performed. Kyulux and WiseChip recently announced a program to use the Hyperfluorescence ™ material in passive matrix display, but again no data on color, efficacy, lifetime, current density or luminance was provided. Savoie finished off his list of unsubstantiated claims by asserting that there is no need for QDs because Hyperfluorescence ™ has the same beam width and can be used in both vacuum and printing processes.